If our media were to be believed you’d think young people were either too complacent, lazy, self-obsessed, apolitical or too cowed to do anything about the government cuts raining down on us all. You could be forgiven for thinking that students have been doing nothing since the December 9, 2010 50,000 strong demonstration against the tripling of tuition fees – from £3,000 – £9,000. It was a massive betrayal foisted on the education of young people, including the abolition of the Education Maintenance Grant (EMA) for further education students. In fact, that demonstration in London probably only made so many headlines because of the violence that happened, after a section of the demonstration broke away to protest at Tory Party HQ. When a few windows were smashed and the foyer and roof were invaded, the police waded in and didn’t hold back in laying into the protesters with their batons. Around thirty protesters were treated for head wounds and Jody MacIntyre, who suffers from cerebral palsy, was filmed being thrown from his wheelchair by police. Fifty-eight young people were charged with violent disorder. Only nineteen have been fully exonerated by the courts, twelve received custodial sentences, yet not a single police officer has been called to account for the injuries they inflicted on students. Alfie Meadows suffered brain injuries following his beating by the police, and only on March 7, this year, after a second retrial, was cleared of violent disorder. Another student, Zak King, was also cleared of all charges. They were cleared unanimously by a jury that heard their testimony recounting how police attacked protesters indiscriminately. Police used batons and shields to strike people, even when some of them had already been beaten to the ground. Much was made by the media and politicians of the smashed windows and the one student who foolishly threw a fire extinguisher from the roof. The press had a field day splashing photos of the violence. They portrayed the largely peaceful demonstration as a ‘violent mob’, in a blatant attempt to smear students willing to stand up against the ConDem government’s cuts. It was a clear attempt to send the message to young people that protesting against the cuts would not be tolerated. In total disregard for the future of young people and other sections of society, our political class, both in government and in ‘opposition’, insist on the need for cuts to prop up their rotten capitalist system, that was brought to its knees in the biggest banking crisis since the Wall Street Crash of 1929. This crisis was not the making of students, the youth, or millions of ordinary families. It was caused by the never-ending search for easy profits in the casino of international banking and finance. Yet even now, bankers award themselves obscene bonuses and we’ve yet to see even one ‘financial wizard’ jailed for this disaster. 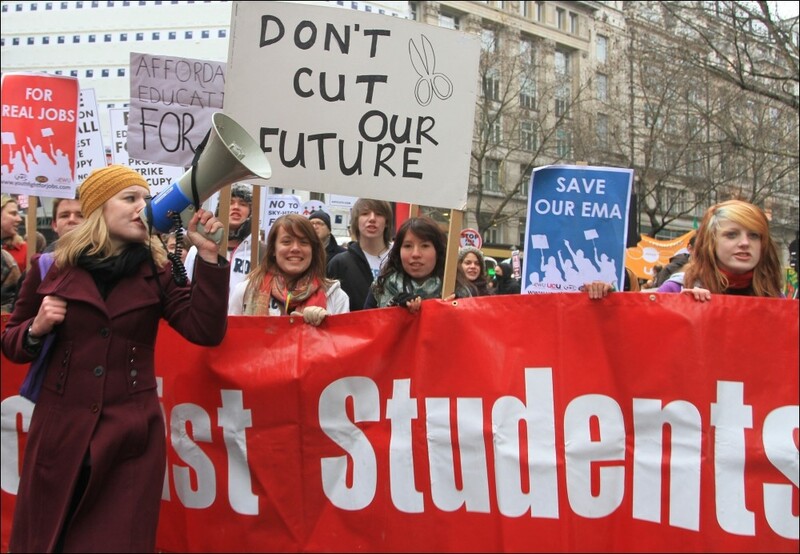 However, as with the growing campaigns of the many anti-cuts organisations across the country, students themselves are still protesting. Some are continuing the fight against this government’s determination to break up our universities and colleges. Politicians plan to sell them off piecemeal to the myriad of private companies, who see our public services as a means to make profits for their shareholders hand over fist. Not content with forcing students to land themselves in debts of up to £55,000 before they even get lucky enough to find a job, subjects deemed ‘Mickey Mouse’ courses are being dropped. There are now 50,000 less university applications, meaning only the children of the wealthy will receive anything like a higher education. Social mobility will remain static, as the lives and prospects of young middle, and working class people will be curtailed. More young people will be forced to compete in an all too meagre jobs to make ends meet. Perhaps one fight back you may not have heard of is the anti-privatisation campaign at Sussex University. There, management have announced plans intending to privatise all 235 non-teaching posts – ground staff, security, cleaners and caterers. To most people, privatisation now means only one thing – higher costs, worse services, pay cuts and job losses. Protests have been running for a number of weeks now, with the University of Sussex Students Union (USSU) leading the way, joining students together with many of the workers whose jobs and conditions are under threat. Protests have grown from dozens, to hundreds, as most recognised the way the University’s authorities, with backing from the Department of Education, are preparing the ground for privatisation. It seems the ConDem government will not stop until all the public sector lies in private hands. And the campaign has stepped up a notch. For nearly eight weeks, students occupied the main management building and brought the university to a standstill. On Monday, March 25, 2,000 students occupied the university’s Library Square. They were joined by students from around the country. Buildings were draped in banners calling on the authorities to ‘stop the sell-off’, and for others to ‘join the occupation’. Van loads of police were summoned to protect Sussex House, the management building, and the conference centre. Students linked arms and pushed their way through into the building and set up camp forcing management to shut down the university. At the occupied conference centre, students from different universities spoke. They told how they were involved in similar campaigns, along with the need to escalate action against the cuts in general by building links with anti-cuts groups and trade unions fighting austerity. Management’s response was to apply for an injunction to get the occupiers out, but it was easier said than done. It took a week before, finally, on April 2, police evicted the students. But, this is certainly not the end of the campaign and occupation was only one tactic. Now students and workers are trying to organise a strike. As at the national student demo of November, 2010, it will take more than physical intimidation to stop students, young people and workers from fighting back.